Anne Neufeld was an outstanding mother to her children, a capable and hardworking secretary, and a remarkable volunteer in church and community. She died as a cancer survivor of 24 years at age 73 on 7 May 2004. Anne was the third eldest child of Paul and Margaretha (Hildebrandt) Peters. When Stalin implemented collectivization with his first Five Year Plan, Paul and Margaretha fled from Chortitza with many others to Moscow in late fall of 1929, hoping to rejoin his family who had come to Canada in 1923, settling south of Plum Coulee. Paul and Margaretha Peters were among those fortunate to get away from Moscow in November 1929, and to receive refugee assistance in Hammerstein, Germany, for some months. They arrived in Manitoba in March 1930 where Anne was born on 19 January 1931 in the village of Blumenort, Manitoba, near Gretna. Anne received her primary and secondary education in Manitoba. She graduated from Mennonite Collegiate Institute, Gretna, Manitoba. Then, at age 18 (1949), she took her first job in Altona, working as a secretary and switchboard operator for Canadian Vegetable Oils. She attended Canadian Mennonite Bible College, Winnipeg, during the 1955-56 academic year. At the Christmas banquet she met Vern Neufeld who had come as a student from Didsbury, Alberta. They married in Winkler, Manitoba on 12 August 1956. While Vern continued his studies and graduated from CMBC in 1959, Anne was employed as a secretary at the College. Vern's first Bible school teaching appointment took them to Altona's Elim Bible school. During the two years there, 1960-1962, two daughters, Cheryl and Sylvia were born. Vern then moved to the Swift Current Bible School where he taught until they moved to Coaldale, Alberta, in 1975. While Vern Neufeld found his way into the trucking business, Anne worked as secretary of Oldman River Regional Planning Commission in Lethbridge from 1976 to 1994. In 1994 at age 63 when she supposedly retired, she took up volunteer work in church, conference and community, including the Canadian Cancer Society. Daughter Sylvia at Anne's funeral summed up what distinguished her life in the minds of friends and community: "How did Mom ever manage to do all that she did? Hectic schedules, jobs, deadlines, and numerous commitments, yet still having time along the way to smell flowers, have picnics, watch soccer games, make special cards, volunteer and ‘fit just one more thing into the schedule'… [She] actually squeezed about 120 years worth of living into [her] 73 years." Anne told the press in 1971 that volunteer work was not a chore, but "an investment" whose biggest dividend came in the form of friendships. "I can go anywhere and feel at home because I know people." Her most remarkable contribution as a volunteer was made to Mennonite Central Committee (MCC) and its related organizations. Having begun by helping with MCC in Swift Current, she got more involved in Alberta's annual MCC sales from 1977 onwards, serving for many years as secretary and helping with the treasury as sales rose susbstantially. Her volunteering reached into the Thrift Store, Ten Thousand Villages, and the Foodbank, and she always seemed willing to do minutes of meetings or account for the money. Her service extended to six years on the Mennonite Central Committee Canada Board. Though the family acknowledged that she was sometimes too aggressive, too challenging of those less able or less willing, her total contribution was considered remarkable. 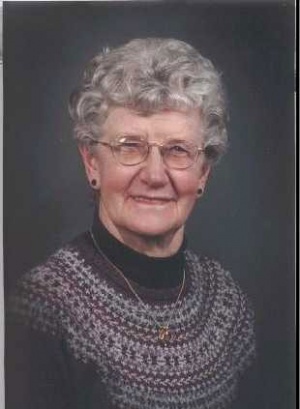 Obituary of Anne Neufeld. Lethbridge Herald (9 May 2004). Sulz, Dave. "Anne dedicates much of her time to volunteering." Lethbridge Herald (2002) [photo]. Neufeld, Vern, Lethbridge, widower of Anne Neufeld, telephone conversation with Peter Penner, 12 July 2005. Redekopp, Helen (Peters),Winnipeg, elder sister to Anne Neufeld, telephone conversation with Peter Penner, 14 and 18 July 2005. Penner, Peter. "Neufeld, Anne Peters (1931-2004)." Global Anabaptist Mennonite Encyclopedia Online. 2006. Web. 23 Apr 2019. http://gameo.org/index.php?title=Neufeld,_Anne_Peters_(1931-2004)&oldid=93055. Penner, Peter. (2006). Neufeld, Anne Peters (1931-2004). Global Anabaptist Mennonite Encyclopedia Online. Retrieved 23 April 2019, from http://gameo.org/index.php?title=Neufeld,_Anne_Peters_(1931-2004)&oldid=93055.